We all know that 3D printing can sometimes be quite tricky. Thus, some guidance from 3D printing experts can help to enrich your knowledge about this cutting-edge technology. 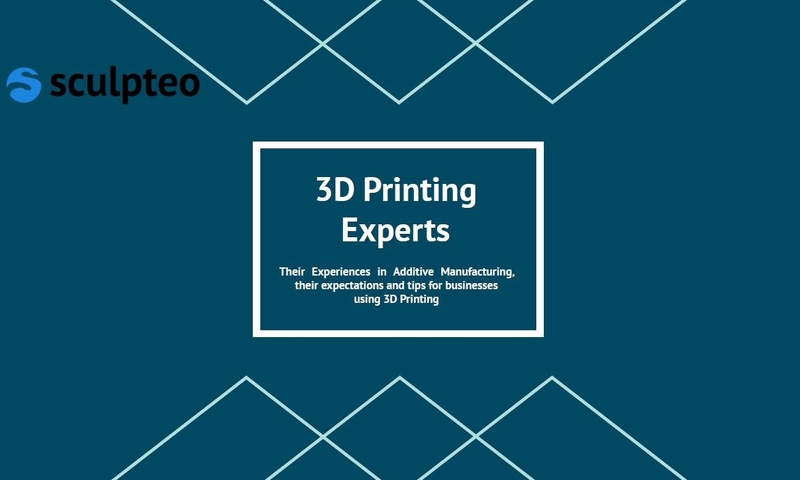 That is the reason why we reached out several TOP 3D printing experts to share with us their experience in additive manufacturing, their expectations, and some tips for businesses using 3D printing. Curious about who are these 3D printing experts? Download this free ebook directly! Who are the 3D printing experts? “One rewarding and great use of Additive Manufacturing technologies use case was a collaboration between UC Berkeley/LBNL and KLA-Tencor to develop and produce 25 mobile Loa Loa virus worm detection devices which, ultimately, will allow to save thousands of lives by detecting and diagnosing the disease and dispensing its associate medicine in time and accurately. My AM group participated to the World Health Organization-sponsored project to use AM rapid prototyping to quickly revise and optimize the design of the device, as well as optimize the production process of the 25 pilot units we sent to Cameroon for beta testing. The project was completed on time and below budget due to the use of AM technologies, and was a complete success, which is now in its phase of full production to expand the program to several countries in Africa”. “One of the most interesting projects we worked on was a tablet enclosure for tablets being used by doctors treating Ebola patients. Someone noted that although the doctors were protected by PPE, the pencils and paper that they were taking notes on were not. We don’t plan to have the bandwidth to support a consumer-based production project. This type of project could potentially require the production of millions of parts. We printed several tablet enclosures in clear SLA material which allowed the designers and users to see if there were any breaches of the sealed enclosures. The tablets in the enclosures could be dipped in a chlorine solution for sterilization”. Chapman Thompson also told us a bit about Google’s centralized additive manufacturing service. Find out more here! Download our newest e-book, the 3D Printing experts now! Become a 3D printing expert thanks to our online resources! Take your 3D printing knowledge to the next level with Sculpteo! Through our online 3D printing service, discover our E-Learning center with a wide range of 3D printing and laser cutting ebooks that you can download directly – and they are free! One of our brand new ebooks: How to Design for Digital Light Synthesis (CLIP) technology. Design Guidelines for 3D Printing and many other e-books to help you master 3D printing! Stay up-to-date with 3D printing! Subscribe to Sculpteo’s weekly newsletter and get all the recent news, upcoming events or most recent projects that might bring you inspiration to start your own 3D printing project. If you like this blogpost, please feel free to leave a comment and to share it with your friends or with all 3D printing enthusiasts on Facebook, Twitter and LinkedIn.